Bret Hart - "Mount Rushmore Volumes 1 & 2" / "Bullwinkle Pond & The 5: Archival Series Volume 2" / "Solo Improvisation - 2001H"
For those of you who have been following our coverage of Bret Hart's work in the past few issues, here's a couple tasty treats from Bret's past, plus some new music. 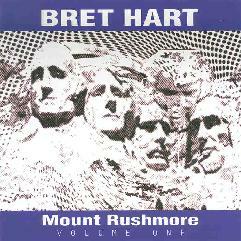 The music on Mount Rushmore consists of the free-improv we've come to expect from Bret. There are fun and interesting sounds galore and numerous styles influence the music. While in the army, Bret was stationed in Korea for much of the 1980's and took advantage of his access to the variety of available instruments to acquire a bunch of them for himself. I hear a lot of interesting takes on the avant-rock/RIO school, though some travel down its more abstract hallways. Nice guitar work and loads of sounds I couldn't begin to identify, though Bret provides a laundry list of the instruments used, both Korean and Western. The guitar work is creatively varied and beautifully atonal. I noted in a couple other reviews, and it's also the case on Mount Rushmore Vol 1, that much of this reminds me of what Fred Frith was doing on his Gravity and Speechless albums. I also hear a few bits that remind me of Robert Fripp, but only in the most demented Bret Hart way. There are also tracks with an ambient feel. Guitars and percussion are still prominent on these tunes, but the music communicates a floating sensation despite any other harshness that may be otherwise blurting about. And close listening also reveals several standard recognizable rock structures blended with the free-improv. But the real treat throughout the set, and what gives Mount Rushmore its own character, is the abundance of percussion instruments and the way they complement the guitars. Percussion is integral to these recordings and the clatter is clearly calculated. A lot of it has a playful childlike sound that reminds me of The Residents' Goosebump album, the one recorded with all Children's instruments. If there's any difference between Volumes 1 and 2 I suppose it's that Volume 2 has some of the most avant-garde and most melodic tunes of the set. Excellent music from the HarTchives that will appeal to both free-improv and avant-prog fans, and, of course, to those who love all things freaky. Bullwinkle Pond & The 5 is a beast of a different sort. First released in 1988, the entire set consists of acoustic guitar workouts that run the gamut from John Fahey influenced to avant-improv, though despite the expected dissonance this is relatively accessible music. Perhaps a good intro to Bret's music for the uninitiated? The best tracks are the ones with multi-layered guitars that blend varied techniques like peaceful strumming and picking based on traditional American music and all manner of free-improv stylings. I like the slow peaceful pieces that combine conventional beauty with touches of dissonance that are equally graceful to the receptive ear. There are also some excellent tracks that feature Bret in several roles that result in a full ensemble of Hart's accompanying each other. Fast forward to 2001. 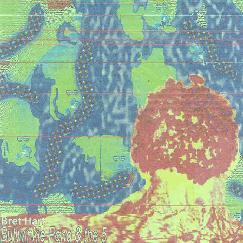 Bret releases a series of solo improvisation CD's recorded using guitars, his MANY homemade instruments, and enough toys to open a Brets ‘R Us music shop. 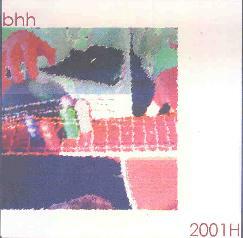 2001H is the CD I'm listening to now and includes tracks with banjoto, dobro, prepared guitar, ScIrving 1, electric guitar, and pseudo-bass. There is nothing I can describe about this music that would communicate what this talented and imaginative artist does without you seeing for yourself so be sure and check out the link below to see Bret's homemade instruments. Think you know what a dobro sounds like? Think again. In Bret's hands it's like an avant-garde take on traditional ethnic sounds... and played like a percussion instrument. I described percussion and percussive sounds as being prominent on Mount Rushmore and it's role has clearly followed Bret through the years. My favorite tracks are the ones played on the ScIrving, a homemade instrument that I won't even try to describe (good photos available through the link below), but it produces a range of seemingly found and natural sounds that come together nicely. But my favorite single track is the one played on what he calls a pseudo-bass, an instrument that produces freakily ambient underwater sounds and has a spacey jazz feel to it. Killer sounding instrument. Having heard a great deal of his music this past year I can confidently say that Bret is essential listening for anyone who enjoys improvisational music. There's a strange accessibility to even the most abstract of his pieces. I think part of his gift lies in the range of his interests. In addition to the freeform scratching, banging, and attacks, the guy can actually write and play... SONGS! Yeah, that's right. Real songs that Joe Musicfan would enjoy. So his playing is informed by a wide range of interests and experiences. For information on obtaining Mount Rushmore you can visit the Homemade Music web site at: http://www.homemademusic.com/shop/58.html. Visit the InstrumenTales Records web site at: http://hartsongs.tripod.com/bret_hart_page1.htm. Check out Bret's homemade instruments at: http://hartsongs.tripod.com/instrument_garden_page15.htm. And if you're beside yourself with fascination with this stuff then check out the article I wrote last issue on Bret's Duets series of recordings at: http://www.aural-innovations.com/issues/issue18/brethar2.html.